Breakfast , transfer to wadi rum , We start our hiking in Rum village, from where we will walk east for 3 km to Rakabet Canyon. 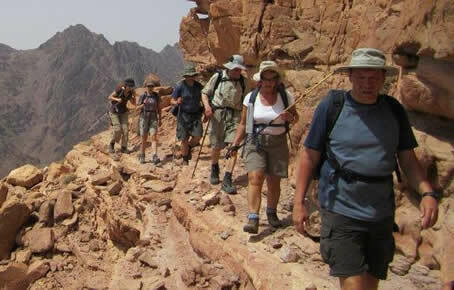 Through out our walk, you will enjoy the views of wonderful sandstone mountains all around us. On the other side of the canyon (Wadi Um Ishrin) we will stop for lunch and sweet Bedouin tea. 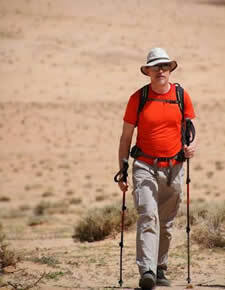 After lunch, we will continue through Wadi Um Ishrin to the famous sand dunes. 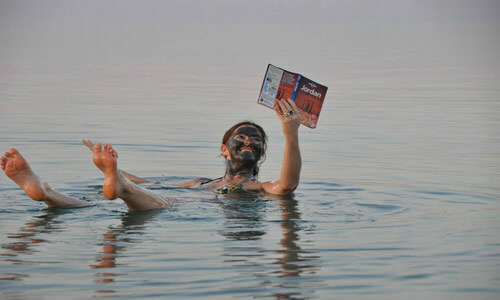 We will then continue on to the Anfasheih inscriptions (dating to 300BC), one of Wadi Rum's most famous historic sites. 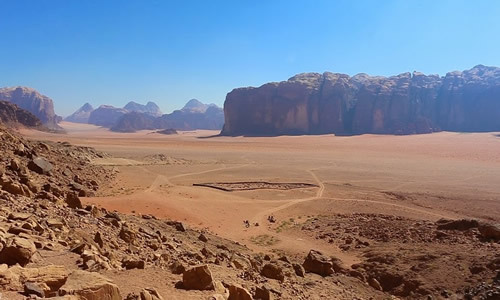 After we finish examining the Anfasheih area, we will then continue our trek through the desert, taking in the beautiful sights and sounds of Wadi Rum. Finally, we will reach our destination of Jabel Mkaser Athbee (Gazelle Mountain) where you will enjoy our traditional Bedouin dinner and tea around the campfire. Overnight stay . 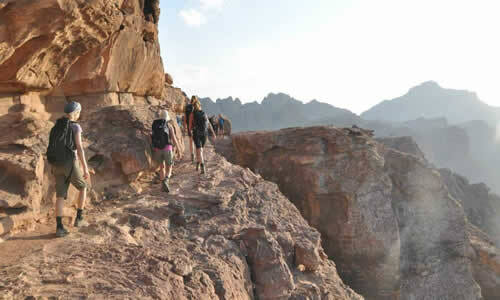 After breakfast, we will begin our hike through Al Mahama Canyon and then continue on to Burdah Natural Rock bridge. Once there, we will stop for a short rest and lunch. After lunch, we will walk through beautiful narrow canyon to Um Frouth Rock Bridge, where you will have a chance to walk/scramble up to the top of the bridge. Finally, we will trek towards our camp while the sun sets, enjoying the color changes throughout and landscape as we walk. Dinner and overnight stay . 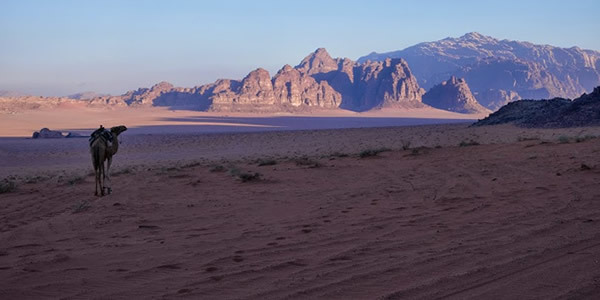 Breakfast Then Hiking in the heart of the beautiful landscapes of Wadi Rum where all sides arise towers and red ocher sandstone, which sheltered some Bedouin families live. Transfer to the heart of the sublime desert regana which with its sandstone masses eroding dunes mixed with blonde and red closely resembles the Algerian Tassili n'Ajjer Dinner and overnight stay . Breakfast then hiking in the heart of the breathtaking scenery of the regana huge dunes dotted with masses of sandstone erosion. drive to Little Petra . 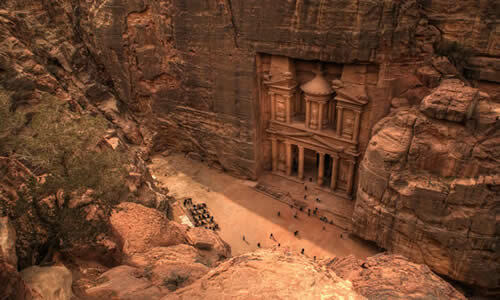 Visit the little petra , Dinner and overnight stay . 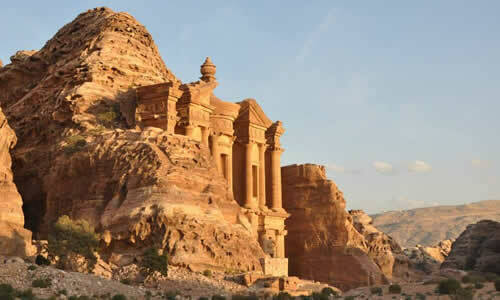 Breakfast , trek from little Petra through the back road to Petra arrive to the monastery ,then visit Royal Tombs, Museum, High place of sacrifice, Qasr al-Bint . Treasury , return to the hotel trough the siq for Dinner and an overnight stay. Our journey continues towards Shobak, impressive medieval castle that dominates the area from the hill. 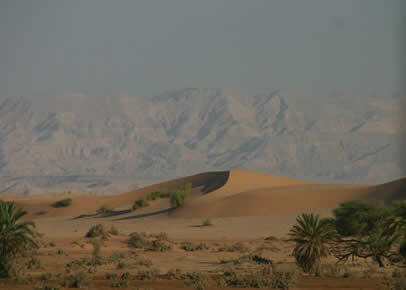 Then drive to visit Dana, authentic Bedouin village in the heart of a beautiful nature reserve. Then explore Karak Castel. Transfer to Madaba for Dinner and overnight stay .